What is a Tennessee Eviction Notice? Tennessee Eviction Notice: What Is It? A Tennessee eviction notice is issued to the tenant by the landlord as the first action in the formal eviction process. Better known as a notice to quit, an eviction notice tells the tenant that they’ve violated the lease in some way and that they must comply or leave the property. If the tenant refuses to comply or leave the property by the end of the notice period, the landlord may then sue the tenant in court to regain possession of the rental property. All Tennessee eviction notices must comply with the state’s landlord-tenant laws as well as with federal housing law. Additionally, many counties in Tennessee have their own housing laws that must be followed. What Are the Components of a Tennessee Eviction Notice? Because a Tennessee eviction notice is the first step a landlord must take to evict a tenant and get possession of the rental property, it’s important that the notice has certain information in it. It’s also important that the notice is legally served on the tenant. Failure to properly serve a tenant can mean that the landlord is unsuccessful in a future lawsuit. The name of the eviction notice. You’ll learn more about the names below. The name of the tenant who signed the lease agreement. If more than one tenant signed the lease, every tenant who signed should be listed. The full address of the property, including any applicable lot number or unit number, the city or town, and the county where the property is located. The reason the eviction notice was issued. How long the tenant has to correct the issue or leave the property. The name and contact information of the landlord or the authorized agent of the landlord. 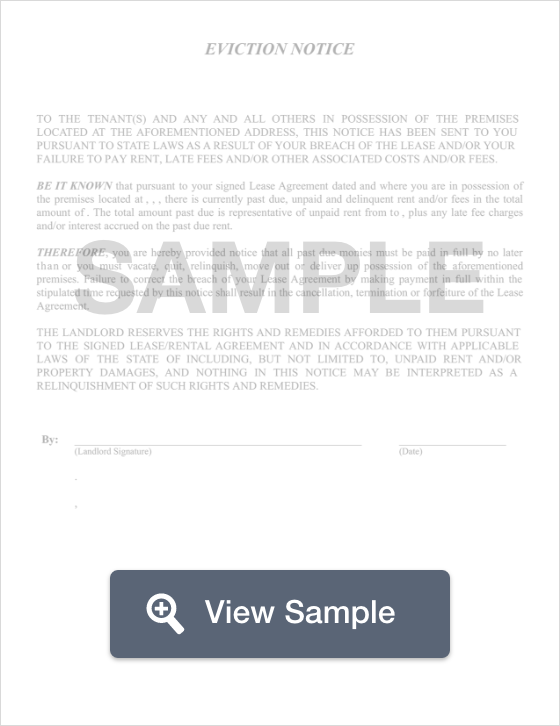 The signature of the landlord or their authorized agent. It’s also important to create and complete a Certificate of Service. This document is used to list the date service occurred, on whom service was perfected, how service took place, and has the signature of the person who completed service. The tenant must be served in person, by posting the eviction notice on the front door, or via certified mail with a return receipt requested. The notice period begins when the tenant is served with the eviction notice. If the tenant is engaged in illegal activity on the property or allows illegal activity to take place on the property, the landlord may issue a 3-day notice to quit for illegal activity according to § 66-7-109(d). This notice may also be used for drug-related criminal activity, violent crimes on the premises, and serious damage to the rental property. This notice does not give the tenant the option to comply with the lease or fix any damage. They must vacate the property by the end of the three days. This notice should explain the reason why it was issued. It may also be helpful for the landlord to list the date that the damage or illegal activity took place. If the tenant is involved in prostitution or drug-related activity, the landlord may issue an immediate notice to quit under § 66-7-107. This notice demands that the tenant vacate the property immediately. Specifically, this notice is used for active prostitution or solicitation as well as the use or distribution of illegal drugs. The landlord should also consider a detainer warrant. A 14-day notice to quit for non-payment of rent is used when the tenant is past due on their rent. It gives the tenant 14 days to pay the rent. In some counties, this is a 30-day notice. The landlord should look at the code in the county where the property is located. The notice should be given the right amount of days for compliance, the full amount of rent past due, how the rent should be paid (such as with a money order), and where it should be paid. The 14-day notice to quit for non-payment of rent is governed by § 66-7-109(a). A 30-day notice to quit for non-compliance is used when a tenant has violated the lease in some way other than not paying the rent or committing some sort of illegal action. Under § 66-7-109(b). The tenant has 30 days to fix the problem and come into compliance with the lease or leave the property. If the tenant has the same violation within six months of issuing this notice, the landlord may then serve a 14-day notice to quit for non-compliance. The landlord should specify how the lease was broken and whether the notice is a first or second notice. What Are the Legal Considerations of a Tennessee Eviction Notice? Eviction notices may be governed by county law. Landlords should ensure that they do the proper research and follow the laws in the county where the property is located. Eviction notices must be properly drafted and legally served on the tenant as discussed above. Failure to do so could negatively impact a lawsuit filed by the landlord. A landlord may not file a lawsuit until the eviction notice is served and the tenant fails to comply with it. Prostitution (including solicitation) and drug-related activities on the property are eligible for immediate eviction according to the law. Landlords may also consider getting a detainer warrant. Unless the landlord gets a court order, they may not remove the tenant’s belongings, lock out the tenant, or disconnect the utilities to the property. It’s illegal to do any of those things without a court order. Landlords must follow The Fair Housing Act. This means that they may not evict a tenant because of the tenant’s actual or perceived nationality, skin color, race, gender, disability, religion, or family status. Family status includes the birth, adoption, or presence of minor children and pregnancy. It also includes whether or not someone is married. Discrimination is illegal at both the state and federal levels. Landlords may not participate in retaliatory eviction. Tenants have a right to adequate and habitable housing. A landlord may not evict a tenant who reports code violations or uninhabitable conditions on the property. Illegal evictions can give the tenant a legal claim against the landlord. The court could fine the landlord for breaking state or federal law. The court could also order the landlord to pay the tenant. If you’re renting in Tennessee, you have rights. You can learn more about your rights by checking out this page maintained by the Tennessee Department of Health. Read the entire eviction notice so that you understand why it was issued. You should also determine how long you have to either fix the problem or vacate the property. For questions, you should contact your landlord. Not all evictions are legal. We discussed illegal evictions under Legal Considerations. If you think that you’ve been victimized by an illegal eviction, you should talk with a landlord-tenant lawyer in your county. Eviction laws can also vary based on county. A landlord-tenant lawyer can tell you whether you have a legal claim against the landlord. If you do, they can tell you what you can do. You can also reach out to a law school near you and ask if they have an active legal clinic. A legal clinic provides affordable legal help to the public. They often have resources or services for tenants. You can also talk to legal aid. You may get access to legal representation or other resources that you can use to protect your rights as a tenant. Landlords must follow federal, state, and county laws for evictions. There are certain instances where the landlord may give an immediate eviction notice. Before the landlord can file a lawsuit against a tenant, they must properly serve the eviction notice and the tenant must refuse to comply with it. Until the landlord gets a court order, they may not remove the tenant’s belongings, change the locks, or shut off the utilities. Landlords also may not evict someone because they report the property for code violations. That is retaliatory eviction and it is illegal. Landlords may not evict tenants based on any of the seven protected classes mentioned in The Fair Housing Act. You can find the list under Legal Considerations on this page. If you’re a landlord, make an appointment with a landlord-tenant attorney in the county where the property is located. You’ll be able to gain clarity on the eviction process in that county.